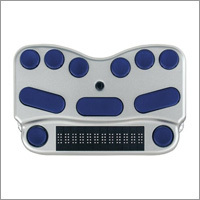 This Week's Featured Advertisement: Two Refurbished BraillePen 12's for $895.00 USD!!! Flying Blind, LLC is pleased to announce the availability of two gently used BraillePen 12 cell refreshable Braille displays with 90 day warranties for $895.00 USD each. These inexpensive, portable, refreshable Braille options are the perfect, pocket-sized companion for your iPhone or Android handset, touting excellent, responsive refreshable Braille cells coupled with a Perkins-style Braille keyboard designed for efficient Braille input. BraillePen12 is a Flying Blind, LLC Endorsed Product and both units are priced at $200.00 USD off of their current suggested list price, not to mention the additional $30 you save on shipping for customers within the 48 continental United States! For more information, email featured@flying-blind.com or call +1 (216) 381-8107. Units will be sold on a first come, first serve basis, so act now while they last! Happy Naw-Ruz (New Year) to all the Baha'is and Persians who are celebrating today! 1) ZoomText ImageReader is a new PC / Camera-Based OCR system from Ai Squared. The cost is $749.00 or $849.00 depending on which camera you buy, and owners of ZoomText get a discount. 2) RNIB offers Getting Interested in Technology videos, covering a variety of topics, and each with written transcript and subtitled edition. 6) An accessibility evaluation of the MFJ 1786 Magnetic Loop antenna for Ham Radio operators has been posted on the Active Elements website. 7) Learn about the newest features of Bookshare, and some familiar ones, on Tek Talk on GMT Tuesday, 26 March at 00:00.